What parent wouldn’t be impressed with a Tech child’s newfound studiousness after yet another story of long hours spent at the Library? How often did a distant girlfriend call Wadsworth Hall or Douglass Houghton Hall in the 1970s, only to hear that her boyfriend was at the Library yet again? To graduates of other schools, it was a place one went for books. For Tech alums, it was a hot spot for good food and better brews. The Library Restaurant and Brew Pub holds a storied place in university lore and culture. You might be surprised to learn that space that The Library now occupies has a long history as a place to dine. In November 1899, the adjacent Shelden-Dee Block first played host to a restaurant named “Board of Trade,” which largely catered to rail passengers at the nearby depot. The Board of Trade offered two private dining rooms and a spacious “Palm Garden Room.” Imagine Venetian marble, gold trimmings, green velvet, and rich red wainscoting–the works. With its reputation for opulence and a wine cellar that would please the most discriminating of sommeliers, it quickly became known as one of “the most exclusive eating establishments of the area.” Over time, however, the splendor of the Board of Trade faded. The first iteration of the Library, soon to be beloved of Michigan Tech students, opened in 1967 under the ownership of Jon Davis. The little pub on Isle Royale Street in downtown Houghton began as a place to hang out and enjoy favorite beverages. 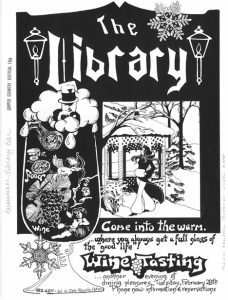 The Daily Mining Gazette in 1972 went so far as to say that the Library boasted the largest selection of fresh cold draft beer in the Copper Country at that time. A Sunday pizza buffet also proved a smashing success. By 1978, Davis had added a spiral staircase of barnwood that led to an upstairs dining room with red carpeting and drapes that subtly hearkened back to the Board of Trade’s bold style. Custom stained glass windows added another elegant touch. At roofed tables and a circular bar in the upstairs room, dubbed “the Homonym,” diners enjoyed a wide range of dishes, including escargot, beef tartare, and Jon’s own famous chili. The business evolved over the decades that followed but remained popular with the student body. In 1989, James (“Jim”) Cortwright, Linda Beeckman, and Jerry Mostek assumed ownership of the business; in 1995, they secured a loan to purchase new brewing equipment and transform the cozy bar into a thriving brew pub. On September 5, 1995, however, disaster struck. The operator of the Portage Lake Lift Bridge spotted smoke billowing from the Library shortly before 5am and quickly called the fire department. The fire, which is believed to have ignited in the kitchen area, quickly spread throughout the cherished building, collapsing ceilings and threatening the adjacent block. Through more than twelve hours of concerted effort, firefighters managed to spare nearby businesses and apartments from the worst of the fire, although smoke and water damage proved extensive. The Library, on the other hand, was a total loss. In some places, this might have been the end, but this is the Copper Country, where sisu abounds. A little over two years later, the Library reopened, and it has remained as much a staple in the community as ever. The old brick walls and famous sign continue to greet patrons daily. What memory does the Library bring back for you? What was the best item on the menu? Did your friends and family fall for the old “I’m at the Library” line? In almost any circumstances, a person would have serious second thoughts about getting in a boat made of cardboard. These aren’t just any circumstances, however, and these are no ordinary cardboard boats. 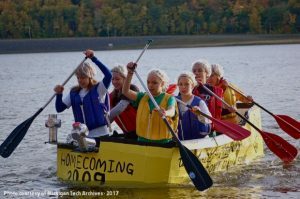 Those who may have missed this part of homecoming tradition should know that cardboard boat races–dare we call them regattas?–have been a part of Michigan Tech’s homecoming activities for well over a decade. The intrepid crafts seem to have first joined the Friday night fun in 2005, when students gathered at what is now Kestner Waterfront Park in Houghton for the big launch. A pep rally got Huskies fired up about getting wet before, in caulked and duct-taped cardboard splendor, teams of students took to the Portage Canal and hoped to stay afloat. Unfortunately, the record of which team took first place honors in this inaugural race does not seem to have been preserved. By 2006, the cardboard boat race had been thoroughly embraced by the student body, and organizers had codified the rules for competition. An article in the Michigan Tech Lode that year explained that at least eight team members had to be in the boat for the entry to be legal. Judges awarded points on the basis of design qualities and speed in completing the race–or, in the event of “large variety of things that go entirely wrong,” portion of the course completed. Over the years, cardboard boating at homecoming has seen some tweaks and the introduction of new elements. A 2007 race saw teams, in the words of the Lode, “man-power[ing] their way through a watery obstacle course.” Spectators that year witnessed a thrilling four-way tie as Sigma Tau Gamma, Healthy Living House, Midnight Express, and Shangri-La all secured the grand prize. The location of the cardboard boat races has also jumped around, from Houghton to Hancock and back to Houghton. What’s remained constant? Husky spirit and ingenuity, for one. It isn’t every school that could manage to fashion cardboard and home supplies into a craft that actually floats, but Michigan Tech students do it year after year. The sheer audacity of the competition is another pillar: It takes a certain kind of guts to be willing to sail a cardboard boat on a lake not known for being warm and gentle. Last but not least of all, the fun never changes. As long as there’s cardboard to be had and Upper Peninsula water to launch it into, Huskies will be grabbing their friends and racing their way toward the finish line, sparking laughter and creating memories that will endure long after graduation day. 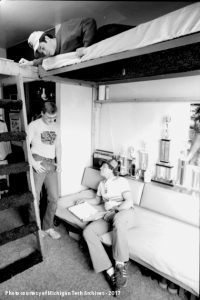 Share your stories and pictures about residence life at MTU. Help us create a housing timeline. 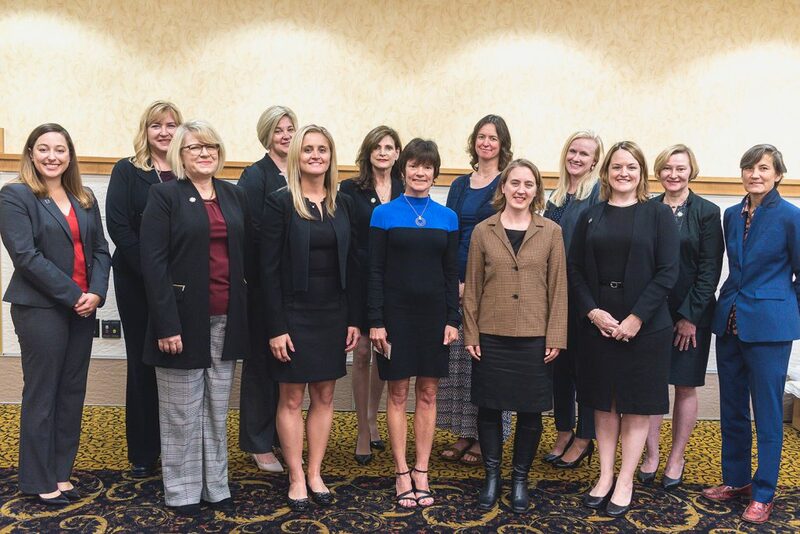 Michigan Tech’s Presidential Council of Alumnae (PCA) honors some of Tech’s most successful women alumnae and recognizes them for their personal and professional achievements. What you said…in September about Tech! “Wonderful man and leader. Had the pleasure of getting to know him while I was at Tech from ’65 to ’69. RIP. – John D.
“Dr. Smith along with Prof. Joe Kirkish helped us get Tech’s first educational FM station on-the-air; WGGL-FM.” – Stan S.
“I was at Tech 1973-1977. 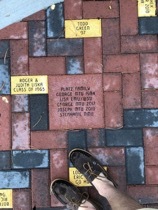 I remember the administration building referred to as Fort Smith.” – Kenneth H.
“Have his autograph on my diploma.” – Ellie C.
“RIP Great Man, President Raymond L. Smith.” – Genny Z. “I graduated in 2014 and moved to the East Coast afterwards. I still keep my 906 phone number and I am proud of it. Reminds me of good old days back at Tech.” – Jasem B. “I met my husband at Tech… although while in school (late ’90s) we were all about the $0.99 Whopper Wednesday! I do use a B&B recipe variation to make my pickled eggs.” – Stacey K.
“I’m not sure when the Michigan Tech Wives Club ended. It was for wives of MTU students. I think early 80s.” – Cynthia H.
“Though I fundamentally disagree with the decision, it will be interesting. The case for wolves in Yellowstone and ISRO are vastly different, and it feels to me like the park has gone out of its way to ensure an allure for visitors and continued research, for a “playing god” philosophy that is inherently in opposition to the core values of the NPS. Still, interesting!” – Darren T.
Why did you choose Michigan Tech? Top answers: Highly rated for engineering. Get away from home and pay in-state tuition. Hockey and skiing. New question: What are your favorite memories from Michigan Tech in the days before your graduation? 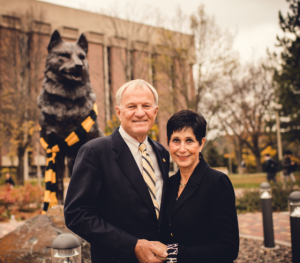 On June 30, 2018, Glenn D. Mroz will step down as Michigan Technological University’s ninth president and return to the faculty. Additionally, Gail Mroz will retire from her position as stewardship officer in the Department of Advancement and Alumni Engagement. All alumni are invited to celebrate President and Mrs. Mroz’s transitions. A celebratory reception will be held Thursday, June 7, 2018, from 4-6 p.m., with remarks at 4:30 p.m., in the Rozsa Center lobby on the Michigan Tech campus. Nothing would please Glenn and Gail more than to celebrate their transition with you over hors d’oeuvres and beverages. 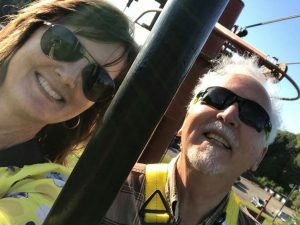 In anticipation of the festivities, the University is collecting personal messages and memories that will be shared with Glenn and Gail at the reception. Those with best wishes, fond memories (including photographs), and notes of appreciation are encouraged to send them to Mroz2018@mtu.edu by May 18, 2018. Please RSVP by phone (906-487-2200) or email jetapani@mtu.edu by May 23, 2018. A block of hotel rooms has been reserved. Those interested are encouraged to contact Joan Tapani (906-487-2200 or jetapani@mtu.edu) for more information.